The Olympics — the pinnacle of sport for athletes worldwide, where hard work and perseverance turn to well-deserved gold, a major sporting stage where countries compete for top honors, and a unique marketing platform where sponsors reach their global audience and reap the benefits of their sponsorship dollars. With 63% of people accessing social media while watching sports on TV, social media has become an important and direct platform for a sponsor or brand to interact with its audience. But a cursory glance at the Olympic data compiled by Hookit reveals an astonishing fact — among the 95 sponsors of the Winter Olympics, 43% of the sponsors did not post on any social media platforms and among those who did, 94% of total interactions on social media were from 10 sponsors alone. Great news! There is more room to use these powerful platforms for more impact! 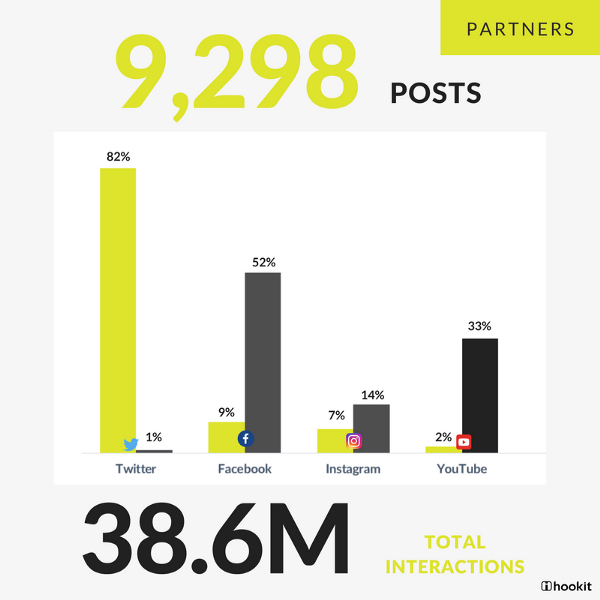 During this year’s Winter Olympics, Hookit tracked 95 Olympic partners, 2919 athletes from 94 countries and 217 Organizations over the 17-day period, across four major social media platforms — Twitter, Facebook, Instagram & YouTube. 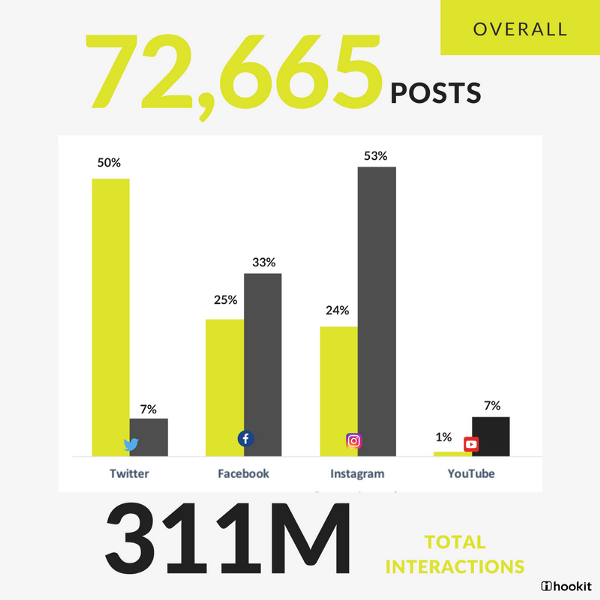 After an analysis of 72,665 posts and 311 million total interactions, here is Hookit’s take on the Social Media Olympics. With an average audience reach of 478 million, the Winter Olympics may not be as popular as their summer counterparts (which can reach an audience upwards of 2 billion), but they are still one of the most watched sporting events in the world. Broadcasting rights form the major source of revenue for the International Olympic Committee along with support from the sponsors/partners who provide financial resources and technology, product, service and staff expertise. The International Olympic Committee (IOC) has two major sponsor categories — the Worldwide Olympic Partners (TOP Program) and The Olympic Games Domestic Sponsorship, based on the sponsorship spend of each partner. The Worldwide Olympic Partners (TOP) — currently consists of 13 brands/companies. To become a TOP Olympic partner, the base sponsorship price for a four year cycle is upward of $100 million. These brands are entitled to category exclusivity, global marketing rights & opportunities and use of designated Olympic images throughout the 4 -year sponsorship period. They also account for 18% of the IOC’s Budget. Tier 1: The Official Partners of Pyeongchang 2018–11 brands/companies with a base sponsorship price of $63 million. Tier 2: The Official Sponsors — 13 brands/companies with a base sponsorship price of $31 million. Tier 3: The Official Suppliers & Supporters — 58 brands/companies with a base sponsorship price of $15 million. Coca- Cola has been the TOP partner in the “non-alcoholic beverages” category for over 90 years. 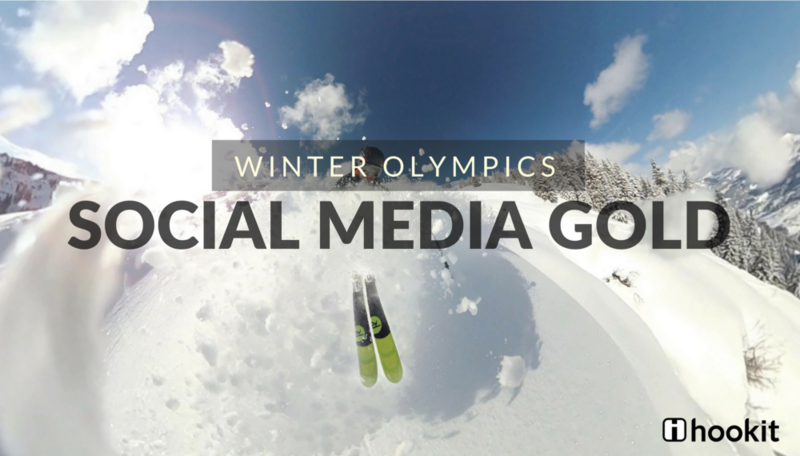 At the Winter Olympics this year, Coca- Cola wins the social media gold with 11M interactions across its social media platforms. YouTube and Facebook were the major drivers of interactions with 8.7M interactions from YouTube and 2.3M interactions from Facebook. The newest TOP partner from this Olympic cycle, Intel broke world records with a drone show during the opening ceremony. Its consistent engagement on social media with 9.7M interactions places it in silver medal position among the TOP partners by engagement. As with Coca-Cola, Facebook and YouTube drove 97% of the total engagements for Intel. The “mobility” partner for the Olympics, this is the first Olympics for Toyota who paid $835M to be an Olympic TOP partner over a 10 year period. By garnering 6M interactions from its social platforms and by overtaking local Korean rivals Hyundai & Kia Motors with 62% more interactions than both COMBINED, Toyota easily wins the bronze. Also, with an engagement rate of 4.9% on Facebook, Toyota has a highly engaged Facebook audience compared to the other TOP sponsors who have a typical Facebook engagement rate of 0.3%. After Chloe Kim, the US gold medalist sponsored by Toyota won the gold medal in the halfpipe, it boosted Toyota’s social engagement by 574%. One of the world’s leading hospitality companies, was also a major winner in social engagement at the Winter Olympics. Despite only being an Official Supporter (Tier 3 sponsor with a domestic sponsorship), the “travel like a local” company had 1.2M total social interactions. With this engagement, Airbnb captures a place among the top 10 partners by engagement beating out 8 other TOP partners who paid significantly more for their sponsorship. Differing from the other TOP brands, 54% of its interactions were from Instagram while Facebook contributed to 45% of total interactions. 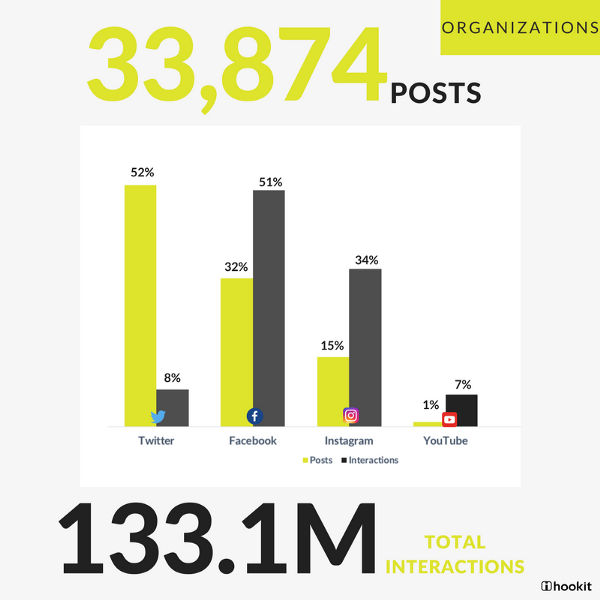 Among the TOP 13 partners, Bridgestone had the highest Facebook engagement rate of 6.6%, clearly demonstrating the brand’s knowledge of its audience and its ability to post content that was interesting for its followers. McDonalds ended its TOP partner sponsorship three years earlier and only served as the Official Domestic Partner at the Winter Olympics 2018. However, McDonalds was one of the Top 10 sponsors by interactions and continues to engage consistently with its audience on all its social channels. There was a marked divide among the social media platform of choice and where the interactions actually happened. Twitter was the platform of choice for Partners. A whopping 82% of total posts were on Twitter followed by Facebook and Instagram with 9% and 7% respectively. However, Twitter had the least amount of interactions — only 1% of total interactions compared to Facebook with 52%. 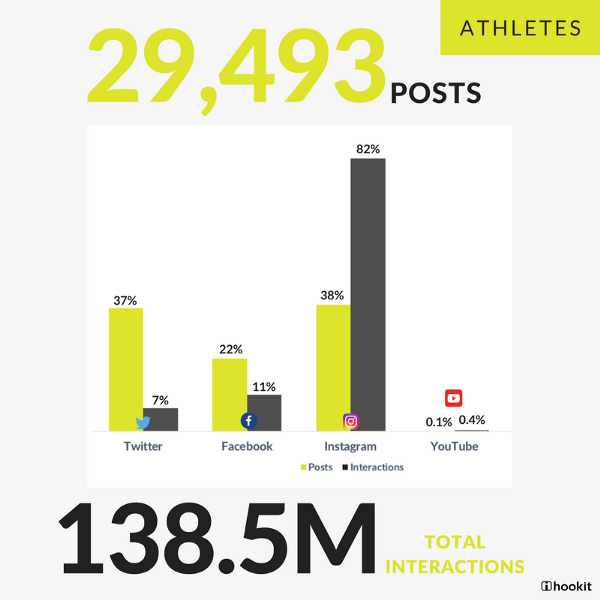 Instagram was the most popular platform among the athletes. It was also the platform with the most interactions — 82%, followed by Facebook at a distant 11% of interactions. 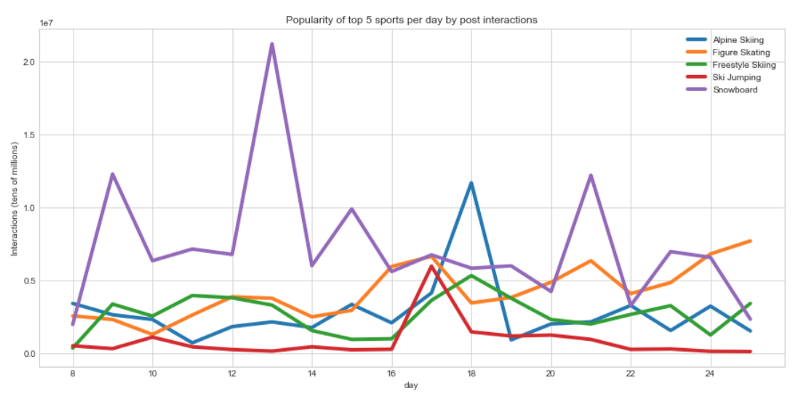 Among Organizations and official Olympic Committees, 52% of posts were made on Twitter but they generated only 8% of total interactions while 32% of total posts made on Facebook had 51% of total interactions. Shaun White was the most engaged athlete of the Winter Olympics with 11M interactions, while South Korean Speed skater Kwak Yoon-gy gained the most followers (follower growth — 494%) followed by Chloe Kim with a 454% follower growth. The International Olympic Committee had 51M interactions across its social channels – the highest number of interactions among the 3231 entities (athletes, organizations & partners) who participated in the Winter Olympics. Among the NOCs, the Canadian Olympic Committee dominated the field with 21M interactions, 50% more than USOC at 14M or the Czech Republic NOC at just over 10M. The Canadians were the most active on social media during the Games as well, posting over 4,300 times. These 3 NOCs topped the podium in new followers as well, with USOC gaining 234k, an increase of 4%, Canada gaining 164k, an increase of 9%, and CRNOC gaining 114k new followers, an increase of 27% from their following before the Games started. With 132M interactions, Snowboard was the most engaging sport of the Winter olympics followed by Figure Skating (77M) and Alpine Skiing (51M). Korean K-Pop boyband EXO, who performed at the Winter Olympics closing ceremony had the most popular hashtag of the entire Winter Olympics. The hashtags #EXO_Olympics and its variation #Olympics_EXO were used 21M times. In comparison, the second most popular hashtag #winterolympics was only used 93k times! USA may have been in 4th place at the final Winter Olympic medal count, but they won big on social media with 53M interactions, which is 62% more interactions than all 94 participating countries combined. Sponsors worldwide spend millions of dollars to associate themselves with the Olympics, but a majority of them make little to no effort to promote their brands on social media. With the explosion of interactions happening on social platforms, it has become essential for sponsors to embrace social media and use it as a means to promote, engage and form positive impressions with intended audiences. By consistently producing relevant content and actively engaging with followers on social channels, brands and sponsors can enjoy a higher engagement, better brand reach and higher returns on their sponsorships. The Winter Olympics 2018 serves as a prime example of how social media platforms can make or break sponsorship investments. LEARN MORE about how Hookit can help capture your sponsorship value! What is your favorite tool to measure social media? Let us know in the comments below!